I even surprised myself with these Rose Cake Pops! I loved making them and even more I loved how they turned out! It started with a trip to ABC Cake Decorating Company to find little green candy cups for the “leaves” under the rose cake pops I had planed to make. You know those red dipped pops with the red swirl and crystal sprinkles to look like the pedals…sounded easy enough! Sadly (luckily) they were out and I had to go back to the drawing board for the “bloom” cake pops that were ordered! I thought maybe I could find a small rose mold that maybe I could push candy clay into…Nope! Not in yet:( So it was down to the last resort and actually had to make them from royal icing:/ I am not too skilled in R.I. or roses for that matter and was a little nervous to say the least, but I had not time to really thing about it, I just had to get it done! I recruited the help of Peggy at ABC to get me everything I needed to MAKE these roses! She hooked me up with the small flower nail, some pre-cut parchment paper squares (these were AWESOME) and the small petal tip (thank you)! I got back and started to practice! It took me about 5 tries to get it looking like a rose, but I was honestly shocked I got the hang of it so quickly! I was having so much fun I didn’t want to stop making them ~good thing too, because I had to make 130 of them;)! After they all dried, I airbrushed a little pearl dust on them to give them their dimension and shine (thank you Dinky Doodle for the courage to start airbrshing, I just love your airbrush!) 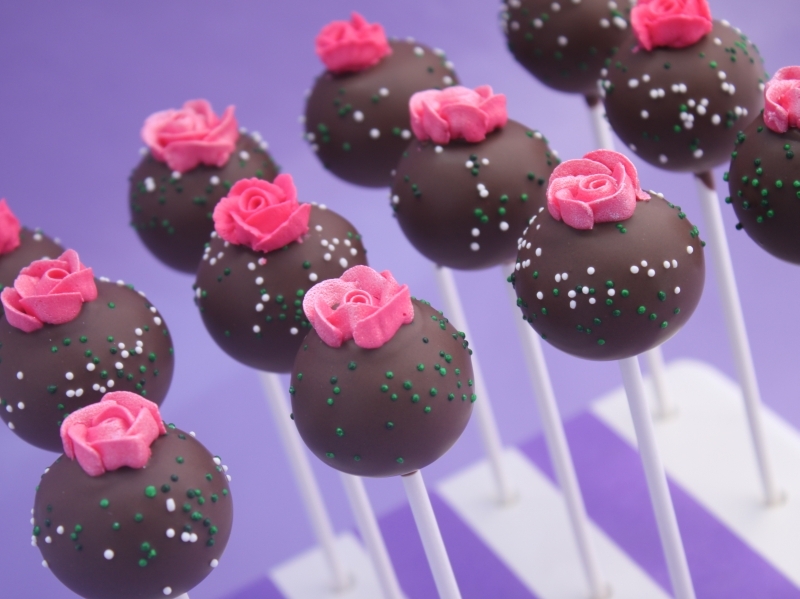 I had so much fun I thought I would make a super quick tutorial on how I made the little roses for my cake pops! Don’t forget to check out our Easy Roller as well;)!